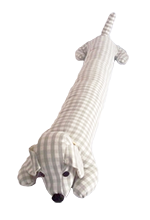 Our draught excluders make the perfect, unique gift for any dog lover. Made here in the UK by our wonderful designers Annette's Allsorts, these dog-shaped draught excluders can be made in a wide variety of different fabrics. A great addition to your home, our draught excluders are not only practical but stylish too. Made in a dog shape, you can choose from a wide selection of beautiful fabrics so match your home décor. Each dog shaped draught excluder in handmade to order for us in the UK by Annette’s Allsorts. These draught excluders are great for keeping draughts out or use them as a cute door stop. They make great home accessories for any dog lover.